New Tagum City Mayor Allan Rellon has announced the appointment to his losing runningmate Cesar Cuntapay as the city’s peace and order consultant for “one peso a year” fee. Rellon announced this during his first appearance as a city mayor during the convocation and flag-raising ceremony of city hall officials and employees Tuesday, where for two hours he spoke outlining his visions and policies for the city hall and the city. In his speech, Rellon underscored honesty, discipline, transparency and true service to the people. A visibly surprised Cuntapay, in an interview, said he was humbled by the mayor’s appointment, adding he would be having a lot of work to do for the critical job given to him and to help ensure that Rellon would succeed in his first term of administration. “I was ambushed by my mayor,” he said in gist, adding that the mayor’s appointment was a complete surprise to him as did not ask for it. Cuntapay actively supported the mayoral bid of Rellon in the last polls although in the end he lost to now Vice Mayor Geterito Gementiza. “I have high respect and regards to Allan, and it’s only me who supported him but the people of Tagum,” he said. Cuntapay is a former police investigator and is known in Tagum City to be a businessman visibly supporting the fight against the taking over of the CDA group over Daneco. 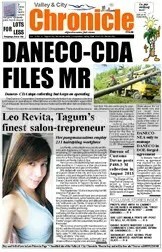 He volunteered his business spaces to be used as immediate, temporary offices and collection centers of Daneco-NEA group when the Tagum Tipaz office was held at bay by the CDA group and after the large of majority of Daneco-NEA employees broke away middle last year from what they described as the “illegitimate, illegal Daneco-CDA”. Cuntapay is also a vocal critic to the high tax rates imposed by the previous city administration. He is the president of the Landowners and Landusers Association of Tagum City and of the Multisectoral Consumers Council for Davao del Norte and Compostela Valley provinces. Cuntapay is bred under the tutelage of strictly disciplinarian Ilocano parents. At young age, he was educated in an exclusive school for boys, and had studied in the seminary of St. Louis fathers from Belgium, before he became a barrister (graduate of Bachelor of Laws) and a policeman serving first Manila then to his home city of Tuguegarao. 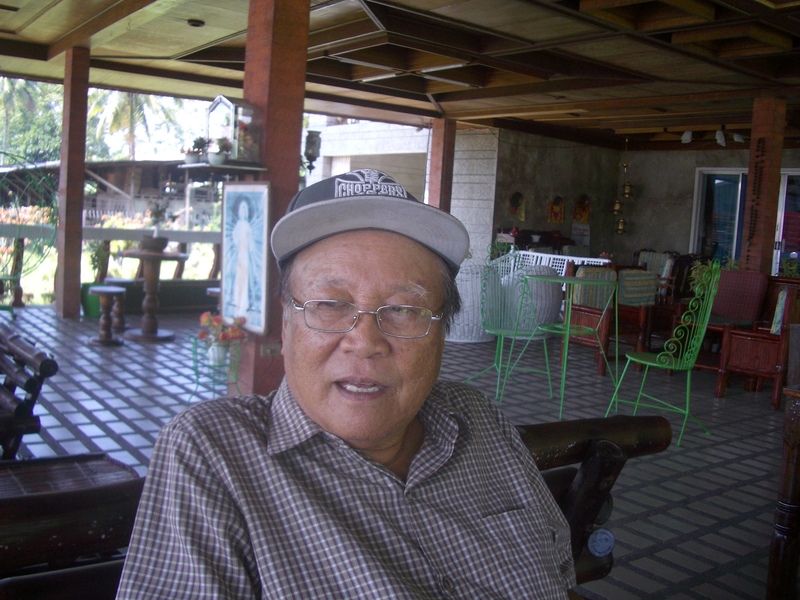 His wife Evangeline Rojo Fernandez was his classmate in the College of Law of the MLQU (Manuel L. Quezon University. They met in the university and things turned out so sweet for them that ended in their marriage in 1979. Evangeline, or Belen as fondly called by friends, is a pure Tagumenya and a known heir lessor-businesswoman in the city. At the backdrop of Cesar Cuntapay is the heroic past of his great grandfather and his brothers who were a feature in a canvass of Philippine history. His great grandfather Don Pedro Cuntapay was the secretary in the drafting of the Malolos Constitution. Placido Cuntapay, the brother of Don Pedro, was a famous guerrilla who led the Gaddang Revolution opposing the Spanish authority and regulations being imposed to the populace. Placido received a decree from Queen Elizabeth II appointing him as the gobernadorcillo of the old region 2 but he later revolted against Spanish rule. Curious and strange events do happen at this formal start of political season for the 2013 election. In Tagum City, the turnaround of Vice Mayor Allan Rellon has shaken the Liberal Party. But the bid of Rellon for mayor has long been thought by many. His running against the Councilor Oyo Uy for the city’s top post is a surprise- thought to eventually come. The next surprise is when Rellon has reportedly allied with the force of businessman-landowner Cesar Cuntapay. Will the controversial real property (RPT) ordinance that was approved under the city council presided by Rellon become a rallying issue of the city opposition during the campaign? How will Rellon handle this when his colleagues would make the RPT issue their punching bag? He can say, look, we’re only two in the opposition, I and Councilor Boyet Gementiza, deep inside I’m against it. Both Rellon and Oyo though pledged to campaign professionally, without the mudslinging, below-the-belt issues. It was this RPT issue that Councilor Bong Aala managed to sneak into the city LP, Uy’s camp. He obviously endeared himself to the city administration when he attacked the provincial board to be dull (“bulok” in his word) for returning the RPT ordinance to the sending city council, not knowing that his mama is part of the board that he lambasted. Later, he clarified he was referring only to the members of committee which recommended for the return of the RPT ordinance to the sender. It was the trade committee chaired by Dr. Fred de Veyra which first made the return- to-sender. They recommended and the entire SP nodded or was silent when the measure was passed in the plenary. That means that the return-to-sender move was a collegial act of the SP. Which means sldo that Councilor Aala did still include his mama in his tirade. During the 2010 polls, only Councilors Gementiza and Aala won from the opposition. Councilor Aala is bright. When he left Gementiza to be the sole opposition to the RPT measure, now he is riding in the admin’s boat (not going to Japan) and he can handily win in the coming election. As to Boardmember Doc de Veyra now, he filed alone as independent candidate, not for LP, not for the Kusog Baryohanon. He was double-crossed by both. Now Doc de Veyra is seen as the Underdog. Don’t count Doc de Veyra just yet, just because he is an independent waging for his reelection. He won in 2010 polls without actually much backing from Tadeco, nay Floirendos. 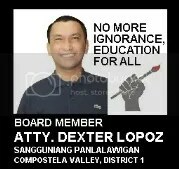 He was the only one who came from Lakas to join with the winning 4 LP boardmembers. Tingnan natin! It’s only in Nabunturan that an incumbent first-termer vice mayor, who was a consistent topnotcher councilor did slide down to run for councilor. Vice Mayor Darwin Tan gave his post to Councilor Mario Angelo Sotto, who would now be the 2013 runningmate of reelectionist Mayor Romeo Clarin. Sotto, a neophyte councilor but a bigtime miner, is reported to have raided ward leaders and barangay captains in town with his cash (from gold) doleouts. Obviously, there was arm-twisting made by Uswag Comval bigwigs. Fresh report we heard is that Councilor Boyet Gementiza filed his COC for vice mayor in tandem with Atty. Paul Suaybaguio, who is running for city mayor. So there’s three-corner mayoral and vice mayoral fight in Tagum City. What a democracy in the capital city of DavNor!… As to the capital town of Comval, there’s an incoming electoral monotony in Nabunturan. Without a rival, Mayor Clarin has to better stump out the worsening problem of shabu drug addiction among his town youths, bar girls and women, as well the problems of loose firearms, shootings and killings in his town …Outgoing Monkayo Mayor Manuel “Jun-Jun” Brillantes slide down to run for vice mayor, like outgoing Comval Vice Governor Ramil Gentugaya for boardmember for next year’s election…. Can Montevista Councilor Jojo Jaoud, who is running for newcomer boardmember in District 1 Comval, trash the over 44,000 votes of controversial ex-police officer Cesar Mancao in the last polls when he was defeated by Congw. Maricar Zamora, who got over 66,000 votes? Mancao is now gunning for boardmember . What about for reelectionist BMs Neri Barte and Paul Galicia vis-à-vis Mancao? TAGUM CITY- Former Governor Gelacio “Yayong” Gementiza, the true-blue Bol-anon political chameleon, is visibly exuding a confident aura in his face knowing his “winning chances” with the entry of Congressman Arrel Olano to complete a good three-corner fight among Tagum’s political heavyweights including him and City Mayor Rey Uy, even while retired police investigator and businessman Cesar Cuntapay scarcely stages an independent mayoral bid. “Makuhaan gyud ug boto si CO sa pag-apil ni Olano (Chiong Oy can have a run of his votes with Olano’s entry),” said Gementiza in an interview, noting that the last-termer congressman “is close to the Catholic Church” and “he (Olano) can even get the solid Iglesia votes”. Gementiza is visibly relying to the splitting of votes of the city’s electorate between Uy and Olano leaving him digging in with his own loyal and patronage following accumulated for decades of being a politico and win all the way to the new City Hall “that is just a walking distance from my house”. In that winning scenario, he quipped: “I will not anymore spend my gasoline allowance and will just walk to report to my office and instead give the allowance to support the media,” he said laughing in jest. And he charged: “If CO will be defeated, it’s a warning to the next mayor nga di sigeg pataka pataas ug buwis (not to indiscriminately raise taxes). Mayor Uy was asked through text message for his appraisal to his rivals but as of press time his reply is still being awaited. In twists of surprises, Gementiza, who earlier took his oath as new member of Lakas-Kampi-CMD, filed his certificate of candidacy (CoC) as independent candidate while Olano, who is supposed to be the District 1 chairman of the administration’s Lakas-Kampi-CMD party, is also running as independent candidate. But on the last hours before the December 1 deadline of candidacy, Olano pulled a surprise by running as city mayor as independent Lakas candidate as he was reportedly not given certificate of nomination by the provincial Lakas chairman District 2 Congressman Anton Lagdameo. Sources said there was ‘quid pro quo’ agreement between Del Rosario and Lagdameo not to give Lakas nomination to Olano although Gementiza said that Olano did not ask for it in the first place. Olano has no vice mayoral candidate in tandem but has two candidates for city councilors former city councilor Rey Alba and Macario Bermudez, who is ending his third term as boardmember. He also added that the support of Floirendos and Lagdameo to him was not also “certain” even if he would stick with the administration party. The former governor has almost complete slate for city councillorship, and has retired Judge Justino Aventurado as his vice mayoral candidate in tandem. On Saturday during the gift giving spree of Olano at his residence, in an interview, the congressman was coy and just quipped: “I’m staging a good fight”. Tataw na gayud nga grabe ang suporta nga gihatag ni AGR – Anthony Rafael G. del Rosario (AGR) sa tandem ni Senador Noynoy Aquino ug Mar Roxas. Gitawag nga red carpet treatment ang gihatag sa Kapitolyo sa Mankilam, Tagum City niadtong Biyernes sa launching sa Noynoy Aquino for President Movement (NAPM) sa Davao del Norte. Matud pa, daghang mga politiko ang misugat kang Nonoy ug Mar, samtang init gayud ang pag-welcome sa kanila ni Governor Rodolfo del Rosario, ang amahan ni AGR. Matud pa libre usab ang kaon sa mga misugat nga mga estudyante ug katawhan sa klase-klaseng sektor. Seguro out of courtesy lang isip amahan sa probinsya nganong mihatag ug usa ka red carpet treatment si Gov. Del Rosario, nga taga Lakas-CMD Party, ngadto sa mga kandidato sa oposisyon. Una nang miingon ang gobernador nga di niya mapugngan ang iyang anak nga mo-oposisyon tungod kay iyang girespetuhan ang kagawasan sa iyang anak sa pagpili kung kinsa ang iyang suportaran pagka-Presidente ug pagka-Bise Presidente. Human sa pagbisita nila Senador Noynoy ug Mar Roxas sa Liberal Party sa Tagum City, mibaniog dayon ang mga estorya nga nag-oposisyon na ang gobernador ug miuban na kani sa panaw sa politika sa iyang anak. Apan dili pa kani makonpirmar dayon ug gani may taho nga nag Lakas-Ramos wing ang gobernador. Kung mao kani ang posisyon sa gobernador, posible nga ang liderato sa na merged nga Lakas-Kampi-CMD o ang Lakas nga Malacanang wing makuha na sa mga Floirendos ug Lagdameo. Hangtud karon matud pa aduna gihapoy konplikto tali kanila ug sa Del Rosario. Pagarpar sa politikang yellow si Boardmember Antonio Lagunzad kay matud pa nahimo kaning mayor sa Tagum tungod kang Presidente Cory Aquino. Morag nakapuntos ang bokal niadtong pag-abot nila Noynoy sa Tagum tungod sa kabaga sa mga tawong miapil sa NAPM. Tama na segurong mobulag na si Lagunzad sa Lakas ug mag Liberal na. Ang nakaapan man gud kaniya kay kusganon siyang maka yellow karon sa pagsuporta kang AGR apan dako pod nga makaadministrasyon kay sigeg deklarar nga dakong loyal lagi siya kang Gov. Dolfo. Consistent lang siya kay may alegasyon man gud nga balingbing ug doble kara na gayud ang politika ni Lagunzad sa una pa.
Mas maayo pa ang gibuhat ni AGR nga miresayn gayud sa Lakas sa iyang pagdeklar nga modagan sa Kongreso isip independente nga kandidato. Karon tataw na siyang oposisyong dako. Ang nakaapan lang pod kay wa pa miresayn siya isip empleyado (provincial sports coordinator) sa kagamhanang probinsyal samtang gigamit niya ang Kapitolyo sa paghatag ug suporta sa mga kandidato sa oposisyon. Nakit-an usab si Compostela Valley Governor Arturo “Chiongkee” Uy didto sa Kapitolyo sa Mankilam nga misugat usab kang Noynoy ug Mar. Apan sa iyang pamahayag sa usa ka text message kanako, miingon siya nga miadto lang siya tungod kay giimbitar siya ni AGR ug sa iyang igsoong Mayor Rey Uy sa Tagum, ug anaa pa gihapon siya sa Lakas. Pasabot nga wa pa miabak ang gobernador ngadto kang Senador Manny Villar nga modagan pod pagka-Presidente- hangtud niadtong Byernes. Newly chosen Tagum Press Ombudsman, businessman Cesar Cuntapay doesn’t think so that the city will be much affected by the current global financial crisis. In his point of view as the chair of a consumer’s group in the city, he said that “Tagum can stand on its own feet”. He said that this is seen in the way the city taxpayers are religiously paying their taxes with subservience even under the high and so much taxation schemes of the city government. “They are left with no choice except to pay taxes,” he said. Cuntapay visibly equates the city consumers he wants to protect to the paying taxpayers. He must have been bedazzled by a question from the local press. He has the right to say that, but isn’t taxes meant for the good of the people? So that we could have so much funds for development if we could squeeze further the people, especially the cheating businessmen to pay their right taxes to the government. Just give what is due to Cesar- he has a right to still open his mind now when the electoral mood is forthcoming- it’s almost December, regardless that he lost in his crack for the congressional post the last time. But I find many of his opinions to be ranging from rational to practical if not- cool huh? 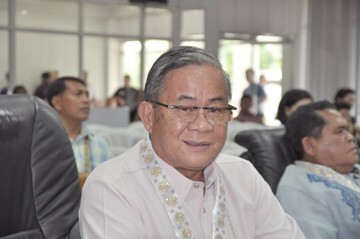 Davao del Norte Gov. Rodolfo del Rosario during the last time he blamed the pole-vaulting growers with harsh words -short of saying dah gigabaan lagi mo! – was optimistic that the province could be spared by the global depression for being a largely agricultural province. Our provincial economy is not much tied to the workings of international banks. This is a blessing although when the Press Secretary Jess Dureza said we have to prepare for the storm, he might have meant that the storm would come in seeing our share of OFWs returning home in droves to be with us by Christmas or early next year when their employers could no longer withdraw their deposits as banks abroad close shop and stock exchange markets tumble one after another. Club, Inc., (DNPRC) have unanimously adopted and chosen retired police investigator and now businessman Cesar Cuntapay as a Press Ombudsman. A press ombudsman is one who receives and hears complaints from the public for mediation, settlement and institution of disciplinary action to mediamen who committed abuse or unethical decorum in the exercise of the profession. He also serves as arbiter and mediator in the conflicts between mediamen. 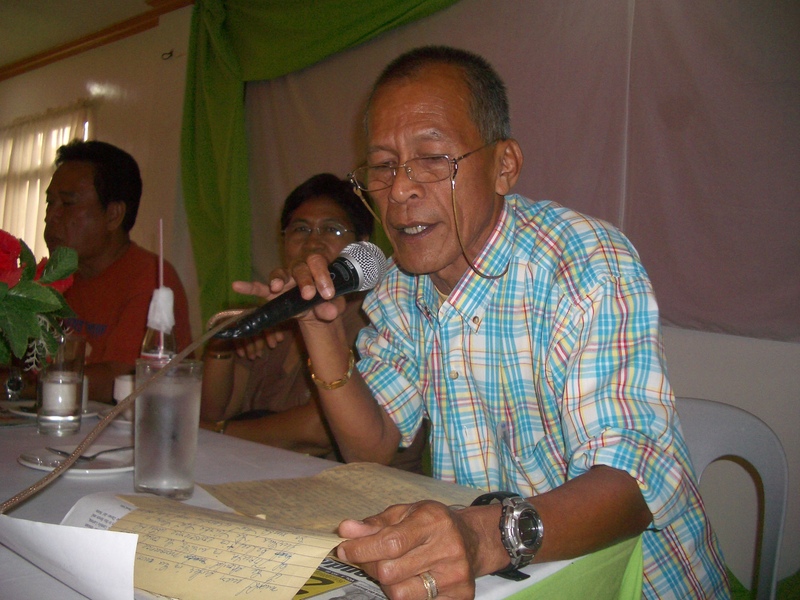 The DNPRC reached its decision to adopt and choose Cuntapay primarily due to his fairness, objectivity and independence, said Gregorio “Loloy” Ybanez, DNPRC president. Cuntapay is also the current chairman of the Tagum City Consumers Association, Inc., considered as one of the most active consumer groups in the region. It actively and proactively works with the Dept. of Trade and Industry. For his part, Cuntapay said he was humbled by the designation of Tagum mediamen and called for vigilance and integrity for an independent and watchdog media in the city and Davao del Norte and Compostela provinces. Rare is the legislator who thinks and reflects on to craft a legislative measure that requires much theorizing while lessons learned and best practices on the ground, are gathered, no matter what his colleagues may first say. But a legislation of this type was passed in Davao del Norte provincial board out from the labor of one who has not even graduated in high school. Now Boardmember Jose Recarido Federiso shows it all that if a local legislator has a will and spirit to pursue and an honest heart to have him understood by his colleagues, he can have his measure passed than torpedoed by say a majority banking on their tyranny in numbers or by the filibustering minority. Nothing of that filibustering sort is yet seen in the provincial board or in Tagum city council, except that a few have been showing time and again their independence of the mind when it comes to a seriously flawed measure, like the yet to be submitted Nickel Suabaguio’s proposed ordinance that seeks to stop urban poor housing for five years. Comval SP, on the other hand, has only the triad LBC- Lopoz, Barte and Codilla, the known Three Mosquiteers boardmembers from Kampi and Liberal allied with Mayor Manuel Brillantes, now whetting up an appetite for semblance of democracy in Cabidianan Capitol. But Federiso’s ordinance on the Provincial Sustainable Integrated Development Process (PSIAD) is a stand out now on the indicator that this is a unique legislation that outlines concrete and practical steps and mechanisms before government plans, programs and budgets are implemented on the ground. It seeks to institutionalize barangay assemblies, taho sa barangay, purok meetings and consultations, people’s congresses, and the like as approaches of people participation, while it aims to realize people and grassroots participation in governance, transparency and integrated development approach.